Darling shell pendant is a lovely reminder of days spent walking on the beach. Toes in the wet sand, bending down to pick up a seashell peeking out enticing you to look more closely at its individual beauty. Perfect on its own or layered with another pendant or chain. 3/4″ wide by 7/8″ long. 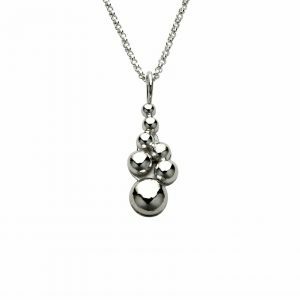 A sterling silver chain in your choice of length is included. I found this small cockle shell on a warm, late spring day along the Florida Gulf Coast, and it is now in my personal shell collection. I made a mold of the shell, and then used fine silver precious metal clay to create the basic form which I then refine to make the perfect piece. My shell molds are only used once so that each piece of jewelry will be one of a kind, just like you are!